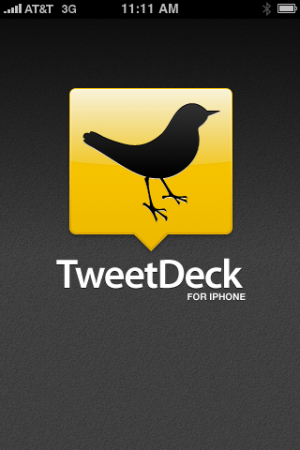 Popular Twitter client Tweetdeck is reported to be in acquisition talks with both UberMedia as well as Twitter itself. For those unfamiliar, UberMedia is a company founded by Idealab’s Bill Gross that has been snapping up different Twitter clients and is rumored to be thinking about starting it’s own rival network to Twitter. This is an interesting situation for many reasons and Mike Butcher of TechCrunch Europe analyzed what the players are probably thinking right now. His conclusion is that this is a binary situation where if Twitter fails to buy TweetDeck they will be potentially losing a lot of future revenue or enabling a rival network. Therefore, Twitter must spend what it takes to buy TweetDeck. I don’t think this situation is so black and white. There are other options and outcomes here, and it’s fun to think through some of this corporate strategy as an outsider. While most would think that TweetDeck would have to be crazy to not sell now while they have two acquirers feeling that they are key to their futures, there is the option to go it alone. Why couldn’t TweetDeck go raise more money, take a little off the table for the founders, and either try and build their own Twitter rival or build a sales team and sell ads on their own? Going the acquisition route can obviously be a nice exit, but it also could see their company vision and dream die inside another company. While denying TweetDeck users access to Twitter’s network would be seen as a bad PR move and piss off a lot of people, I have a feeling all those TweetDeck power users would move to an alternative client to get access to Twitter. Again, I wouldn’t assume that if UberMedia started a competitor that people would be more loyal to their client application than they are to all the users on the Twitter. This might depend on interoperability, but I know that I would ditch TweetDeck for another client if it was only accessing a much smaller network that lacked all the people I was already following and who followed me on Twitter. It will be interesting to see how this plays out, but I don’t think it’s as simple as “whoever buys TweetDeck wins”. It’s an important piece of the puzzle, but I think there are more layers here than instant winning and losing based on who grabs it.